Two brothers, Alec and Aric Avedissian, started Rareform in 2012. Alec was living in El Salvador when an idea came to mind: He noticed that the locals using old discarded billboard advertisements as roofs for their houses, and how the material the vinyl advertisements were made out of were extremely water-resistant, durable, and lightweight. 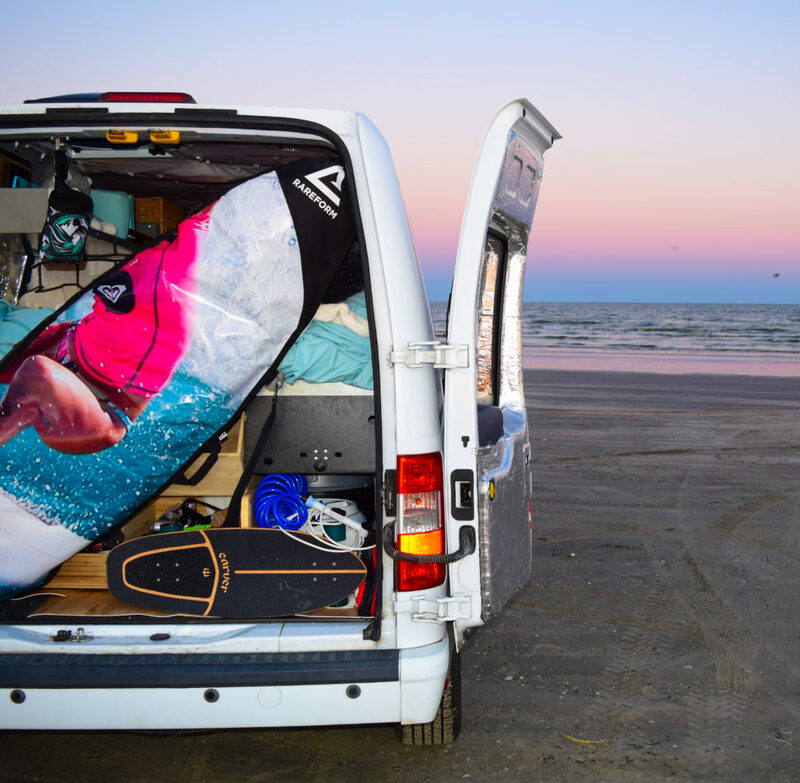 The Avedissian brothers’ concept was to adopt the practice of using discarded vinyl advertisements and adapt them to products manufactured for surfing. An old advertisement laying in a landfill would have no value to society, so why not repurpose it? Their idea was to take the hideous billboards you stare at while stuck in traffic and to transform the material into a surfboard bag for the environmentally conscious surfer, as the call for new and innovative recycled or sustainable products has reached an all-time high. Rareform is passionate about reducing the amount of waste in landfills by taking trash and turning it into treasure. Photo courtesy Rareform. 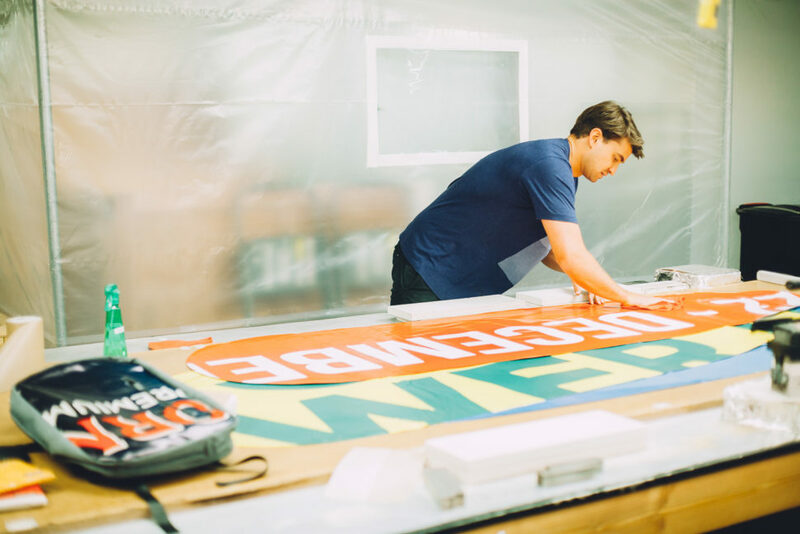 Rareform has set up a deal with Southern California billboard advertising companies such as Lamar Advertising and Clear Channels Outdoor to help reuse approximately 20,000 pounds of retired billboard signs normally sent to a local landfill. All the work done for Rareform is done in house and is guaranteed to be 100% American-made. One billboard yields around 10 board bags, or 1,000 wallets. A few weeks ago, the brothers made an appearance on the TV show Shark Tank, pitching their business model to the suits and eventually taking a deal for $300,000. While the brothers were basking in their new cash infusion, we sat down with Rareform's Kara Morin and asked her a few questions about Rareform. When Rareform first started, what products were initially launched? We started with surfboard bags and then expanded, so now there's duffle bags, tote bags, wallets, and more recently, we launched iPhone cases. Also, we launched a cycling line, so we are now making bags for cyclists. We are very rooted with surfers, but wanted to expand upcycling to other lifestyles. Who are your primary suppliers for the billboard vinyl? We have two primary billboard suppliers: Lamar Advertising and Clear Channel, which are both the leaders in outdoor advertising in the world. Billboards are usually up for 4-8 weeks, for a typical run, and then after that they usually take them down and dismantle them before they end up in the landfill. We intercept them and bring them into our warehouse which is located just north of L.A., in Agoura Hills. Do the suppliers send you everything? Do they send all the billboards they have or do you ask for a specific design? We don't ask for a certain design, necessarily. It's pretty random. There is a huge shipping container, which arrives at our office. It's a mess. We have a warehouse team that organizes the whole thing, folds them, washes them and then we hand cut all the items. 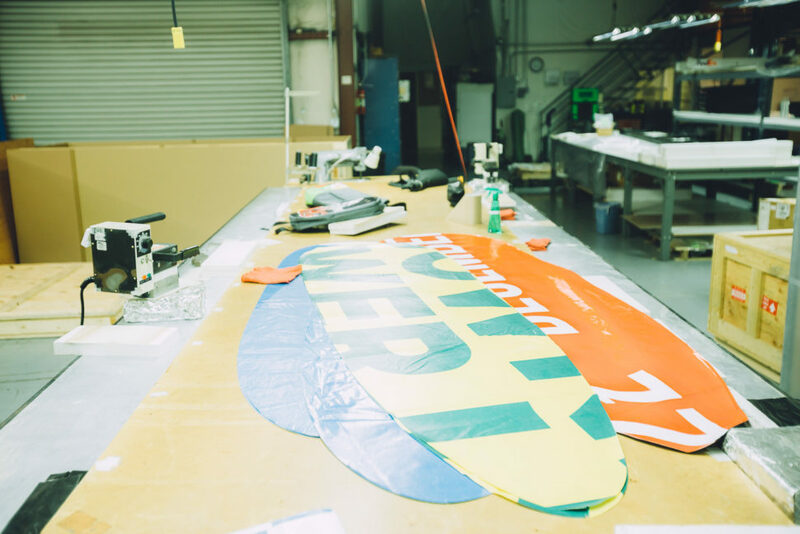 Backpacks have a different cut shape than board bags, so the different templates all get hand-cut, right here in our warehouse. 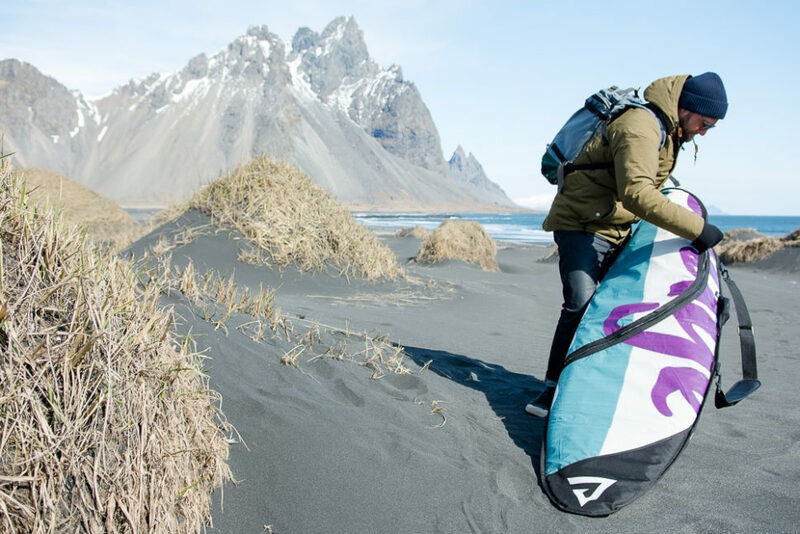 How is your process different than other board bag and surf product companies? Upcycling is a huge part of it. Each billboard we hand-cut, so each item is one of kind. There are no two board bags that look alike. It's useful when you have your surfboard on a rack with other people's boards. When I was in college, everyone had their surfboards all together, and everyone had a black bag, so it was hard to figure out which one was yours. Since every bag is one of a kin,d it's easy to pick out the color and style of your bag and you know exactly which one's yours in the mess. Is it important to Rareform that you are environmentally friendly? Surfers are constantly using the ocean and caring for the environment, so they notice a lot of pollution and trash on beaches. Surfers are really excited that we are using a material that would typically go straight to the trash, and instead, using it for something they love. Vinyl is naturally waterproof, super durable, and nice and thick, so we're not having to compromise quality in order to make a great bag. Quality-wise, our bags exceed other competitors’ board bags. Knowing we are doing something good for the environment makes it even better. Rareform didn't always have these big suppliers, though. Did Rareform's collection of vinyl start with the Avedissian brothers going into the landfills and actually finding billboards? We always joke that they would steal billboards at night, but that isn't true [Laughs]. The brothers called companies and pitched the idea to them and offered to take the retired billboards off their hands, and they were really excited about it. The suppliers are doing us a favor because we get the material, but they are also doing something good to help the environment. Are there any new products we can look forward to in the future? Around Christmas time and Black Friday, we launched our Union duffel bag and Weekender duffel bag. It's been our most popular product. We launched the Union duffel, which is the upgraded version of the Weekender Duffel Bag because it has more pockets and looks a little nicer. In the spring of this year, we're launching a handful of new wallets and updating our old ones, like a new bi-fold wallet, new passport wallet, and adding a few new products. We are re-releasing the hip pack, which is really popular at music festivals and are coming out with a few new tote bags that are focused more on yoga gear, like your mat. What's your favorite canvas vinyl design that you have seen? A few months ago, we got an L.A. Lakers billboard and we made a tote bag, which we cut into lot of pieces. Our basic tote bag on our website had most of the logo on it. I'm a pretty big sports fan, so that was cool for me. We've received Disneyland banners like Star Wars designs with R2D2 on them. The card holder wallet. I use it every day. I don't like carrying a big wallet, and I like something that fits in my pocket. It’s super nice, and when people see it, they want it. The other thing I love is the Weekender duffel for traveling. It's perfect for carry-ons in an airplane, but I can easily pack a week's worth of stuff into it. Also, while everybody else has a black or grey bag, I have one that is blue and white and one that is purple. I definitely know which one is mine right away.